Both my grandmothers, and mother knew how to knit and crochet, and growing up I always loved to receive a handmade piece from them. I attempted to learn, but always seemed to get too frustrated and just quit. It wasn't until I was 15 that I decided I really wanted to learn. "Now is the time Kathleen, you need to learn." I remember thinking to myself. So I set aside the frustration, and did not leave the couch beside my mom until I could FINALLY single crochet. 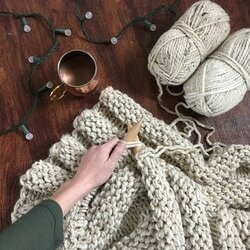 Let me tell you, when I finally realized that I could crochet, my heart was OVERJOYED, and my love affair for yarn and all things crafty began! 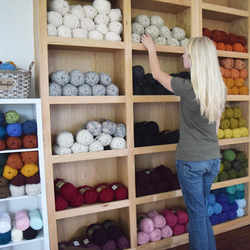 After that, you couldn't keep me away from the yarn stores, youtube videos, and my yarn stash began to grow! I started making scarves and hats for everyone that I knew, you couldn't stop me. Throughout my High School years, I really only made pieces for people that I knew, it wasn't until my Freshman year of college that, that would change. When I went to college, I struggled, like most people, to figure out how to balance classes, social life, and other activities. Going to class and being an 'adult' was the last thing I wanted to do. I had this longing to be a creative, and to spend my free time learning knew techniques, and making new things. I had a yearning, but I couldn't quite figure out what it was. It wasn't until I saw my room mate pick up a pair of knitting needles. I was so intrigued by the sound of her needles clicking, and by the possibilities that knitting brought. It was right then & there that i decided I had to learn how to knit, that was what I had been yearning for! Right after that, I drove, probably too fast, to Michael's and bought my first pair of knitting needles, and an orange skein of yarn. I spent that whole evening, into the wee hours of the morning watching youtube videos and learning how to knit. Again, you couldn't stop me! My love for knitting grew, and my abilities grew along with it. Two years later, I started having people within my social group ask me to make them mittens, hats, scarves, you name it. I was happy to and didn't think anything else of it. It wasn't until my sister asked me, "Kathleen, have you heard of etsy? You could start selling your things online." WHAT?! I had no idea that this wonderful website existed. As soon as I was by a computer, I began looking into everything I would need to start an etsy. What would my shop name be, what should I list, what colors should I do, who should model my pieces, who will take my pictures?! Those were all questions racing through my mind. My initial shop name was 'Koobeedaa Designs'. That is my maiden name sounded out. No one could ever pronounce Kubida, so I had to spell it out, and the name stuck! I then bought business cards and began to market myself through etsy. I had a few sales, but not very many. After that I only focused on my shop for about a year. I was entering a difficult period in my life, and I also had my student teaching. The combination of both did not work out very well! My last semester of college I was student teaching, and my husband was deployed. I really did not have any time, energy, or enthusiasm to knit or crochet. My husband was gone for a year, and during that time, I could count on one hand the number of times I picked up my needles. It wasn't until he came home that something re-kindled my desire to create! I had never used instagram before, but had heard that it was a fun app, and I could maybe do some marketing on it. So I started one, and added all of my previous pictures. I fell in LOVE! I loved the knitting community that I could connect with, I realized my love for taking pictures, and I loved interacting with other people! Needless to say, I am a huge fan of instagram, and I have been very blessed by the people I have been able to meet through it! After a few months back into a normal routine, we moved from Colorado to a Cattle Ranch in Texas. I have always loved cows, and so being able to be surrounded by them was a huge blessing, but I was not a fan of the hot weather. I am a mountain girl at heart, and love a good cold snowy day. That has been a hard adjustment for me, but knitting has been very helpful in getting me through the initial shock of moving away from home. Living in a warmer climate has also been tough on my heart as far as my business. Last summer in the 100+ degree weather, I was taking pictures of winter items outside. (Our house has no natural lighting, so all of my pictures have to be taken outside.) People don't always wear knitting goods in the winter here, so my target market here was very small. That is another reason why I am thankful for my instagram community, I am able to reach many people beyond my small little borders here in rural Texas. After living in Texas for a few months, I decided that 'Koobeedaa Designs' just didn't fit what my business was anymore, so I brainstormed with my sister for weeks about what I could change it to. All I knew was that I lived in the country now, so something that had 'country' in it. I love the mountains, so if I could I wanted to incorporate that into my name as well, and since I was a knitting & crochet shop, I thought that I should keep 'designs' in the name as well. Well, after many failed attempts, my sister finally said: "What about Country Pine Designs?" YES! I knew right away that, that was what my new name would be. It was perfect for who I was, and for who I am blossoming into. I know that God has many great things in store for me here in Texas, and I am thankful that he has blessed me with the ability to create in order to try to bless others along the way. I am forever grateful for the friends I have made in this knitting community along the way, and am excited to see what the future holds for Country Pine Designs.